Goddess guarding the southern frontier and Lower Nubia, killing enemies of the king by her arrows. Depecited wearing the white crown of Upper Egypt adorned with antelope horns or plumes. Her Egyptian name Satjit, later Satet, is found on jars from the Step Pyramid at Saqqara and is described in the Pyramid Texts as cleansing the king by means of four jars from the Elephantine. 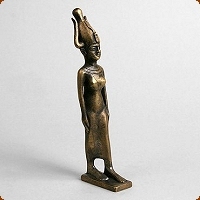 Satet, was thought to be a daughter of Ra, god of the Sun, her crown contains a solar disk indicating her relationship to Ra. She is associated with the Nile inundation and as 'Mistress of Elephantine' is the consort of Khnum and, by inference, mother of Anukis. An early liaison between Satis and Theban Montu is known.